Arthurdale, West Virginia, has a peculiar history. It was America's first New Deal Homestead—a community designed by the federal government under the watchful eye of Eleanor Roosevelt. Like so many other projects planned in Washington, it quickly went over budget. 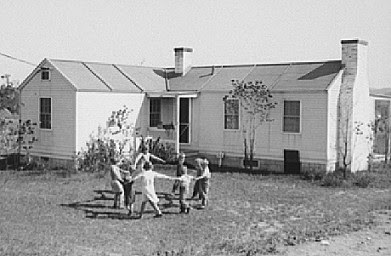 The pre-fabricated houses, even when it was known that they were unsuitable for West Virginia winter and wouldn't fit their foundations, were still built but then torn to pieces and remodeled. An article in the August 1934 Saturday Evening Post speaks of how chimneys were built eight feet away from their houses' sides, after which the houses were reconstructed to meet the chimneys. 165 homes would eventually be erected (160 of which still stand), to be inhabited by poor folks willing to have their daily lives micromanaged by politicians. The location of Arthurdale—far from transportation and markets and therefore unattractive to industry—doomed the project. The social experiment ended in 1948, and the properties were sold off to the homesteaders for as low as $750. I wonder if it was Eleanor who came up with the imaginative names for Arthurdale's roads.